�The faculty of deduction is certainly contagious, Watson.� Sir Arthur Conan Doyle, The Problem of Thor Bridge. The gaslit streets of Victorian London. Horse-drawn broughams, hansoms, and dog-carts rattle over the cobblestone streets, pulling their passengers through the pea-soup fog. On every street corner, you pass booksellers, clubs, prisons, music halls, doctors, tea houses, and steamship companies. Yet in the shadows and dark alleys of this great city, horrible and cunning crimes are committed daily, confounding the policemen of Scotland Yard. Still, even the most ingenious crime is only a puzzle for the world�s only consulting detective�Sherlock Holmes! Sherlock Holmes Consulting Detective is a cooperative game of observation, logic, and the science of deduction for one to eight players. You and your fellow players take on the roles of members of the Baker Street Irregulars, Holmes�s cadre of young agents, whom he employs to gather information in his cases. Armed with the facts of the case, the London Directory, a map of Victorian London, the daily issue of The Times, and your own wits, you must unravel ten devilishly complex cases, each with a unique casebook. If your mind is sharp and your logic unflawed, you may even outshine the great detective himself! Ten fully revised cases for the Sherlock Holmes Consulting Detective line from Space Cowboys with the newest standalone box, The Thames Murders and Other Cases. Like the previously released Jack the Ripper & West End Adventures, The Thames Murders and Other Cases offers ten thrilling cases, each one drawing you into the mystery surrounding a deadly crime in the world of Sherlock Holmes. Whether you�re playing alone or with up to eight players, you�ll need everyone�s wits to solve the case. Important note: The ten cases in The Thames Murders and Other Cases are the same ten cases released in the Ystari version of the game Sherlock Holmes Consulting Detective, now fully revised and retranslated. The solutions and contents of some cases have changed. Like previous adventures in the Sherlock Holmes Consulting Detective line, every case in The Thames Murders and Other Cases draws you into a perplexing mystery on the streets of Victorian London. Each case begins the same way�with an introduction read aloud, relaying the facts of the case. From that starting point, the city of London opens up before you. 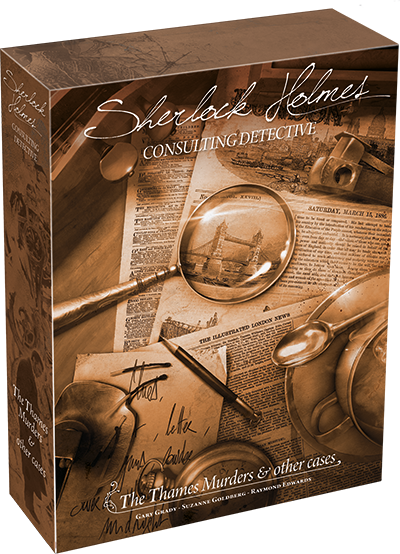 Sherlock Holmes Consulting Detective offers a drastic departure from every other board game�even other cooperative games. You and your friends are not confined by taking turns, one after another. You aren�t even limited in where you can go. The entire city of London is yours to investigate and explore, spread out on a physical map for you to pore over. Beginning your investigation is simply a matter of deciding where you want to go on the map. Perhaps you and your fellow investigators decide to visit the scene of the crime and search the area for clues. Every location on the map corresponds to a simple set of coordinates�by looking up those coordinates in your case book, you�ll be able to read what you find at the scene of the crime. The passages within this case book give you the chance to notice suspicious objects and read your interviews with suspects� but you won�t find your way too far without consulting some of the other resources at your disposal. Alongside your map and your case book, you have some other pertinent items, starting with your London Directory. Within this short booklet, you�ll find the addresses of countless people within London. Perhaps you learn that a certain Leticia Garcia may have been implicated in your latest case. By looking her up in the London Directory, you can find her address, allowing you to turn to her section in the case book and continue your investigation! And of course, you wouldn�t be fully equipped for your job without a detective�s most overlooked tool: the daily issue of The Times newspaper, available for you to peruse and scan for any relevant information. Even though the clues in The Times may not be plainly laid out for you, there�s still plenty of information that may prove crucial to interpreting a clue and deciding on your next step�if you can find it mixed in among articles, obituaries, and advertisements. The clues are all before you, and ten unique cases await in The Thames Murders and Other Cases. From the curious case of The Munitions Magnate, to The Pilfered Paintings, to The Mummy�s Curse, every case offers a new challenge for your deductive skills. It�s up to you and your friends to conduct your own investigations, visiting the witnesses, the suspects, and the scene of the crime in order to piece together the narrative behind each crime. Do you have the cunning and the deductive prowess to solve your way through ten more cases for Sherlock Holmes Consulting Detective? Even if you�ve played these cases before, some of our new tweaks and changes may surprise you.